*UPDATE 5/16/18* – The class action lawsuit mentioned below is proceeding through the system and it appears that owners of vehicles that have suffered engine damage (up to and including complete annihilation) may be able to receive some kind of compensation based on the vehicle mileage. I don’t have specifics, but if you are one of those people that have suffered premature engine failure, seek a lawyer working on this case, as there are several agencies working across the country that will be able to include you in this. If you have a late model VW 2.0T and you are wondering about things to keep an eye on, VW/Audi 2.0t timing chain problems should be at the top of your list. The engines in question are in the 2.0 TSI family, and include the CCTA, CBFA, CAEB, CAEA, CDNC and CPMA code numbers. These engines went into hundreds of thousands of cars between 2008-2013. The specific defect in these engines is the chain tensioner responsible for the timing jumping teeth. With the timing messed up, the valves will hit the pistons and bend ie. total failure. Most reports of engines failing right at startup. Later engines of the same EA888 family featured an updated chain tensioner, which is used to update early style cars. Luckily if you have an early TSI engine, the preemptive repair is not that big of a deal. The part is cheap and not too hard to replace, just tedious because you have to access the timing cover. On cars with transverse mounted engines this is done through the passenger side wheel well under the fender liner. On longitudinally mounted engines, you will most likely have to remove the bumper to replace the tensioner. 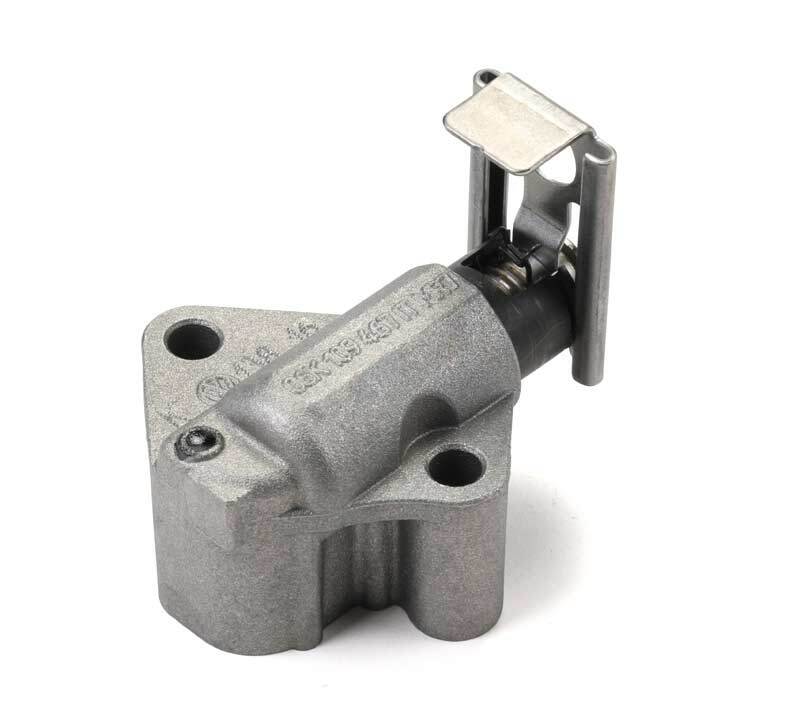 In 2016, this defect was causing so many engines to fail that a class action lawsuit was filed, and many cars were recalled to have this part replaced. That does not mean that yours has, and if you don’t know the specific service history of your car you should replace this part. If you don’t, you are conceding to live with the fact that you have a potential ticking time bomb under your hood. Many reports claim the updated style tensioner (which we carry on eEuroparts.com) started going on cars somewhere between 2012 and 2013. You can differentiate the older style between the new one by looking for a metal bracket on the part that contacts the chain guide. 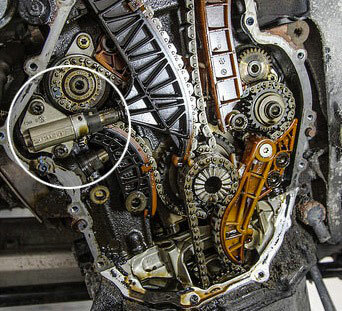 One source specifically cites the defective 2.0t timing chain tensioners being replaced with updated versions in July 2012, but we can’t say for certain. If you have any TSI engine Passat, Jetta, Golf, GTI, Tiguan, CC, A3, or A4 made before the end of 2013, this all applies to you. If you are going to replace your upper tensioner, we recommend also getting a new lower 2.0t timing cover since they are stamped metal and often bend during removal because they are stuck on with sealant. There is no specific gasket for this. This is a common source for leaks after replacing the tensioner. Many customers choose to replace other major timing components while they are in there replacing the tensioner, such as the chain and timing guides. Other things that are really good to replace while replacing the tensioner would be the Cam Bridge Bracket, which fits over the ends of the cam gears, and a timing chain. On the Camshaft Bracket there’s a fine screen that commonly dislodges and gets sucked into the narrow oil passages, effectively becoming everything it is fighting against. You also can choose to replace the timing chain, although most cases of complete timing chain failure is due to the tensioner failing and causing a ‘chain reaction’, sorry for the pun. If you replace the timing chain you will also need to rent special tool to lock the camshafts, and you might as well replace the brittle plastic guides at the same time. This is of course a big DIY day, versus just replacing the known defective tensioner and going on your way. Be sure to look for cam chain stretch. Up to you. I have a 01 adui 2.8 the timing chain tensioner is out .l was told I have to change both tensioner and front belt and part that goes with it.